This French Bulldog nicknamed Willy sold and went to a new family. • pre spoiled & loved. Willy is like her brother's, very typey for the breed, nice, thick, short, stout and coby. He is black with no brindle that I can see. This little dude will be a heart breaker for sure, love his head, just can't say enough about his over all appearance and personality. He has been vet checked and was free from hernia's, no heart murmurs, nice tight hips and knees. Mom is Winnie and dad is Vegas, I would estimate his mature weight to be 17-19lbs of pure muscle. 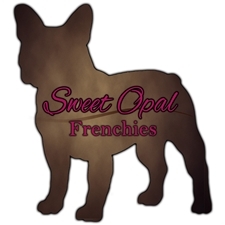 All of our puppies are AKC registered, we only breed French Bulldogs, all of our adults are vet checked annually for, eyes, heart, ears, teeth, hips and knees, all of our males are OFA Certified. Our puppies leave here to their new homes with their AKC Registration, Vaccination Record, Written health examination form, a current Health Certificate, instructions, Microchip registration information and a puppy pak, which consists of their puppy food, a plush toy, a chew toy and first puppy collar.